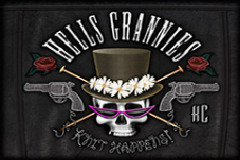 With images of pensioner punks across the reels, Hells Grannies is a fun pokie from Genesis Gaming that comes with a rewarding free spins game and wild substitutions to help bring in extra wins as the 5 reels spin across 25 paylines. The high quality graphics extend to a background image of a garage door surrounded by tyres which sets off the reels nicely and it’s all done with a slightly gritty look that suits the theme of tough biker gals and their not so tough knitting that forms the framework to the reels themselves. Anyone familiar with how Guns N’ Roses design their artwork will see where Genesis Gaming got their inspiration for the game logo and fonts used throughout. A flaming skull flanked by red roses sits atop the reels, while other symbols take it further with a top hat similar to the one always perched on guitarist Slash and the guns being featured. But Guns N’ Roses have never been associated with the fine art of knitting, and the high card symbols and the control panel beneath the reels look as if they are made from wool. Using the controls, players can choose to have a bet from just 0.01 per spin up to a maximum of 100.00 although to activate all lines and therefore claim all winning combinations they will need to wager 0.25 as a minimum and adjust up from there. The coin value can be set to as much as 0.20 and up to 20 coins can be put on a line, so it’s got a fairly flexible bet range to suit all budgets. 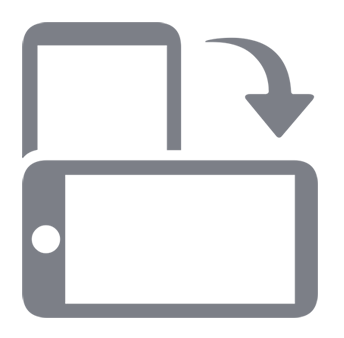 Clicking the View Pays button takes them to the payout schedule that outlines what will be won for each combination of symbols. The playing card 10, J, Q, K, and A are the lower value ones, with the various grannies and tattooed knuckles making up the higher value symbols. Our gangsta grannies treat players to some extra wins when the Knit Fast, Die Warm wild symbol stops in the right places. It will act as all others with the exception of the scatter symbol to help complete winning lines, while just 2 wilds on a line will be worth a prize and a full row of 5 across the reels will pay out the game jackpot of 2000x the coins per line amount. The top hat and guns symbol is a scatter, which is worth 2x, 5x, 10x or 50x the total bet per spin when landing 2, 3, 4 or 5 in any positions on the reels. It’s also the trigger for a Spin It To Win It round which opens up a bonus wheel that’s flanked by a couple of our grannies. The wheel has various spins and multiplier combinations around it and to get started, players just need to click it, and when it comes to a rest, a section will be highlighted to show what will then play out. There’s 5 different combinations that can be spun up, with 5 spins and all wins multiplied 2x, 10 spins with a 3x multiplier, 15 spins and 3x, 20 spins at 3x and lastly 20 spins with all wins multiplied 5x. If 3 or more scatters land during this round, players will get to spin the wheel again once any remaining ones have finished. The reels are standard during the free games, so although players have a decent chance of winning a multiplier prize it’s not guaranteed. Hells Grannies certainly has a fun theme that’s fairly unique (apart from when it was the subject of a Monty Python sketch about 40 years ago.) The whole design is entertaining, with the knitted patterns being a highlight although maybe we could have had more grannies decorating the reels rather than the high card symbols. It’s not exactly packed with bonus features either, with the wild symbol and free spins round being the only ones, but with the multipliers in place at least the free spins game can be quite rewarding. Some players may also like to see the popular gamble game included, however, as these can be quite risky, maybe it’s better left out.